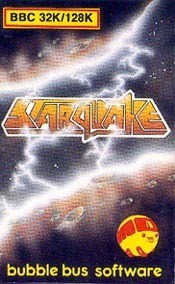 Bubblebus were a small company, in fact Starquake was the only game they ever released on the BBC, because it had had such a massive success on the other home computers, notably the Spectrum and C64. It was adored by many, and it was no exception on the BBC Scene, puzzleingly though they never tried to further their successes. A scrolling arcade game with very Spectrum-like graphics (so not very good then) but it plays well, and the animations are very good indeed. It is nice to see a game that at least attempts an original graphical and plot style, and expands the genre rather than making another boring Citadel clone.